VEX Sack Attack is played on a 12’x12’ square field configured as seen above. Two alliances – one “red” and one “blue” – composed of two teams each, compete in matches consisting of a fifteen second autonomous period followed by one minute and forty-five seconds of driver-controlled play. The object of the game is to attain a higher score than the opposing Alliance by Scoring Sacks and Bonus Sacks in your colored Floor Goals, Troughs and High Goal, and by having the most Robots of your color Parked at the end of the Match. There are a total of ninety-eight (98) Sacks and four (4) Bonus Sacks available as Scoring Objects in the game. Most Scoring Objects begin in designated locations on the field, while some are available to be loaded prior or during the Match. 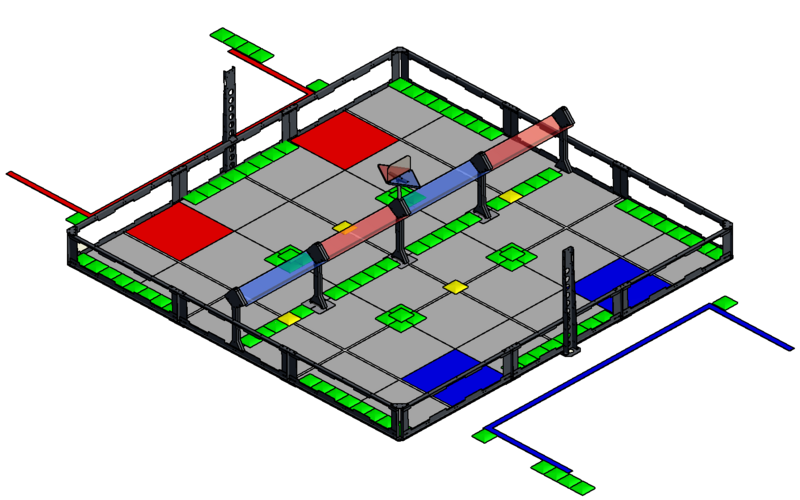 Each Robot (smaller than 18”x18”x18” to start) begins a match on one of their Alliance Starting Tiles. There are ten (10) scoring areas, five (5) of each color, of varying heights which teams can Score Sacks or Bonus Sacks in. Alliances earn a bonus for having the most Robots of their own color touching their Alliance Starting Tiles at the end of the Match. A bonus is awarded to the Alliance that has the most total points at the end of the Autonomous Period. Tournament Champion 2625 Tech-Know-Commandos Worcester Technical High School Massachusetts, U.S. Excellence Award NAR NAR: MooseEagles North American Robotics Pennsylvania, U.S.